Having said that, since I took these photos last weekend there are already about 5 other new products I have been using that I have fallen hard for! First up, and much raved about by me for the past few weeks are the Violet Voss Holy Grail palette (review!) and Charlotte Tilbury Matte Revolution lipstick in Love Liberty (review!). The Violet Voss shadows are super buttery and pigmented and I have been totally gravitating towards the warm, reddy tones which is a bit of a change from my usual cool neutrals. But it is quite hard to source this palette at the moment-keep an eye on the Violet Voss website for restocks. This literally is the only eyeshadow palette I have been using for weeks. Love Liberty thankfully is way more accessible and is the perfect velvety, luminous berry shade. Everything about this lipstick, inside and out is utter perfection in my eyes. I pair this with MAC Morning Coffee (pictured) liner for a perfect match. This liner stops the colour bleeding and works brilliantly with berry tones. Soft and Gentle was resurrected from my make up stash after I complimented my colleague on her cheek colour and she said she was wearing this. And now I am obsessed! Somewhere between a hybrid of a blusher and a highligher, I have been using this as a cheek topper for tons of luminosity. The slightly rose gold tone is flattering without being in your face. I also use this as an inner corner highlight and to highlight under my brows. My Artis 10 brush may look a bit worse for wear, but I had just washed it and it was still drying-but I needed to take this photos #BloggerProblems. This brush is perfect for buffing in liquid foundations-it literally takes me less than a minute and the brush leaves the most seamless, streak free finish. Extremely expensive at £60 but the amount I am using this means the price per use is actually very justifiable. It's a bit of a pain to wash if I am honest but it's so good that I can bear the annoyance! This is the first Anastasia Beverley Hills single eyeshadow I have tried and it is immense! 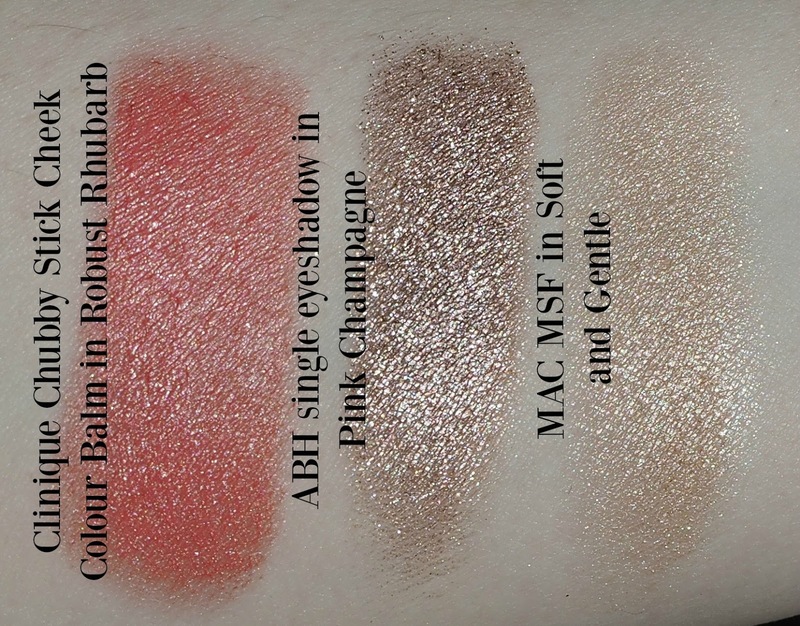 Similar to the Make Up Geek foiled shadow formula, this is pigmented, blendable and very long lasting. The shade Pink Champagne is a stunning shimmery cool taupe-the sort of shadow I live for. I really want to try more from the ABH line-have just ordered the Master palette and can't wait for it to come! I've included the Kat Von D Trooper liner before in a favourites post but I have been really loving it again. I am really really bad at eyeliner and I just find this one the easiest to use for an even, seamless line. I will admit it isn't the blackest of blacks in a liner but this is my perfect everyday liner. Lastly the Clinique Chubby Stick Cheek Colour Balm in Robust Rhubarb is my go to, use everyday cream blusher. I love the ease of this product, I just scribble on my cheeks and use a short stippling brush to blend in. It has a slightly slippery texture so it's very easy to blend out and the peachy coral tone is universally flattering. Do you love any of these products as much as I do?